For my first blog of 2018 it only felt right to write My Horse Box a fabulous farewell. Having been there from the very beginning of the companies journey as one of the first subscribers to the luxury equine subscription box. I was honoured when invited to officially blog for the team, I have loved every moment of being part of My Horse Box. Click here to take a look at favourite pieces from each box - always chosen with help from Oscar, and more recently so, Kitten. Supreme Products included a tub of their Heel, Sole & Frog Care product. Feet can be wet and smelly at this time of year and Oscar's frogs take a lot of TLC to remain strong and healthy. Since the arrival of November's box on the evenings when time allows, I clean and towel dry Oscar's feet and apply the Heel, Sole and Frog Care liberally to, well as it says...the heel, sole and frog, using my hands. It has no smell and a soft, clay like texture. As Oscar is stabled overnight, it can get to work cleaning, cleansing and hardening his sole and frog whilst he is stood on clean, dry bedding. Then of course, there are the evenings when time doesn't allow and my saviour is Bio-Hoof from Safe-Care Equine. After picking out each hoof I simply spray Bio-Hoof directly onto the frog and sole, it cleans and disinfects overnight whilst Oscar is stabled. Keeping smelly frogs at bay! Now for the outside/upside of the hoof, something shiny and delicious; Topline Naturals Hoof Dressing. 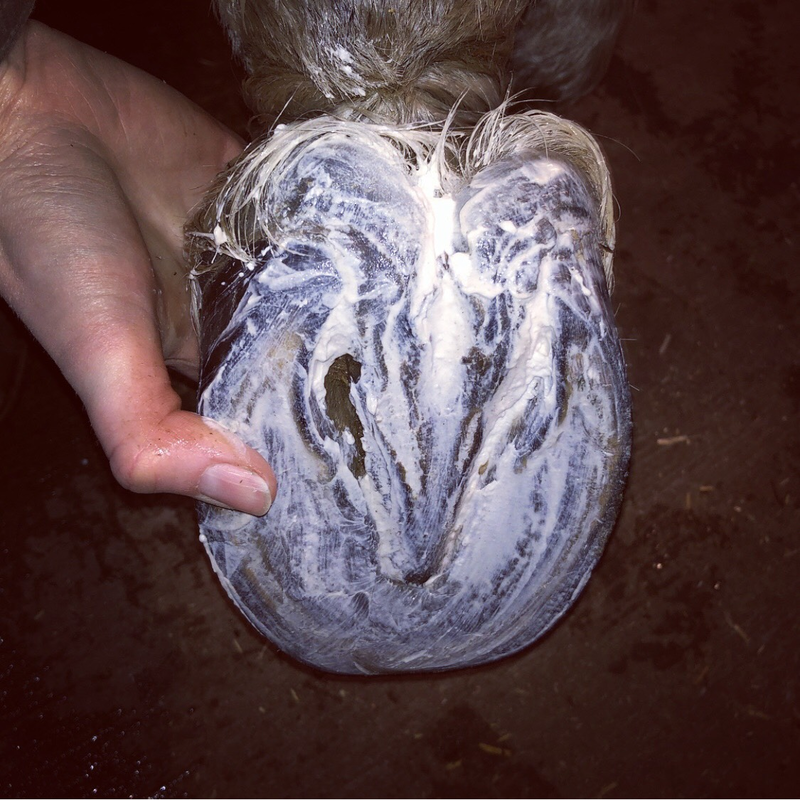 Applied using a hoof brush, it is thick in texture and smells of traditional pine tar, fresh eucalyptus and tea tree, organically grown ingredients to help regulate the moisture content in the hoof, providing a degree of protection against hooves swelling and contracting (=cracking) and against fungi and bacteria. Dark in colour it also makes hooves shine, a lovely tack room product. 1. A hoof pick, hand crafted by Bespoke and Personal for My Horse Box subscribers. I remember the lesson of how to pick out a horses hooves being one of the first I was taught and the importance that was stressed upon the task. I also remember Oscar not being very good at it when he first came home and the hours I spent teaching him how to lift his legs, calmly and politely. A hoof pick is always hanging by our stable door and hooves are picked out before turnout, and after. Before riding, and after...the theme, before and after most things. 2. 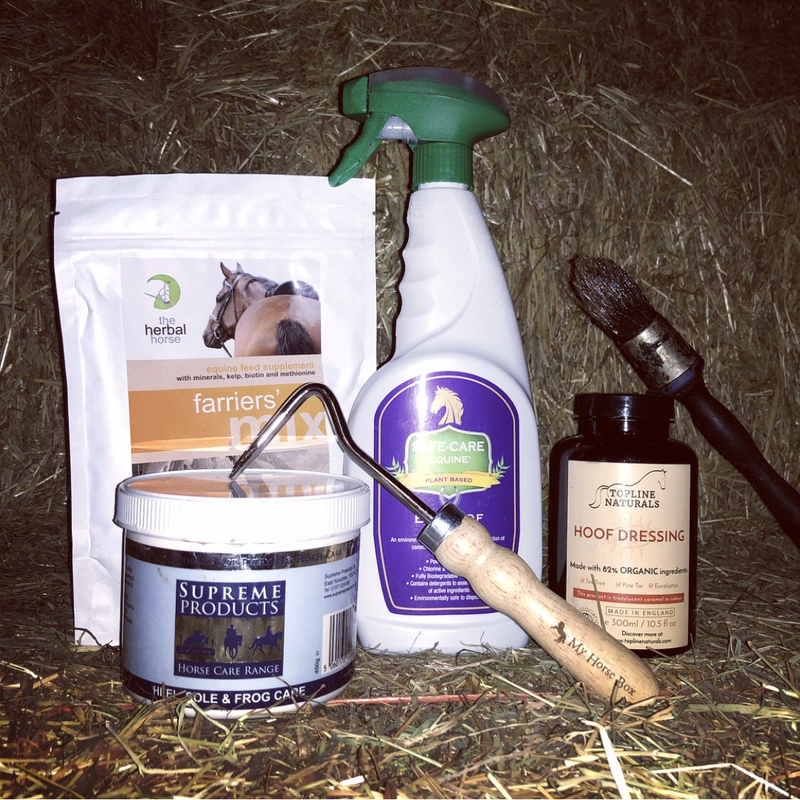 Nutrition; some horses are naturally blessed with good feet, others need a little more. My Horse Box sourced a sample of Farriers Mix, a cutting edge equine feed supplement to maintain and support healthy hoof and horn growth. Containing kelp, biotin and methionine. Fortunately Oscar is blessed with good feet on his diet of balancer and forage, the beauty of the native breed, therefore I have gifted this to a friend whose breed of horse is less fortunate with his feet. My Horse Box costs £34.99 for a one month subscription, make it your new years resolution to treat yourself at least once, for the thrill and anticipation of the fantastic products that will be found inside. Or better still, treat someone equine obsessed, My Horse Box will not disappoint.